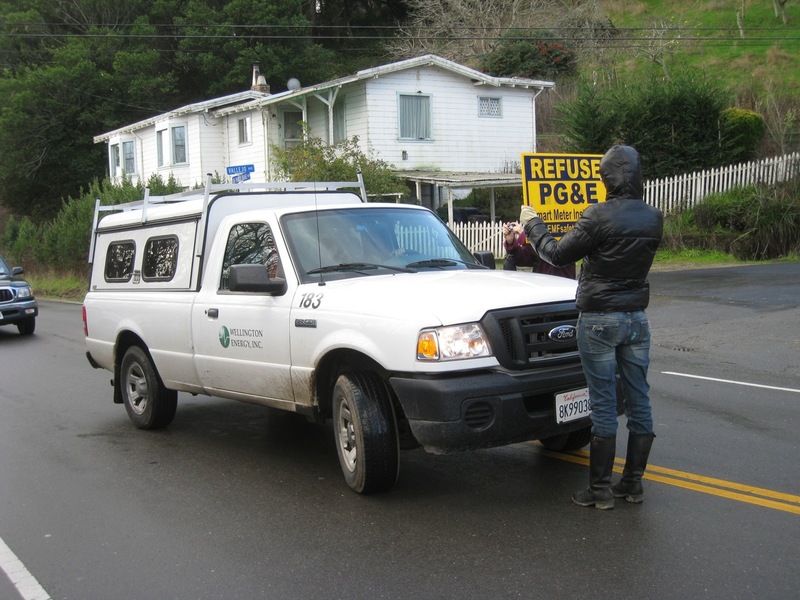 Point Reyes Station, CA- Two mothers from West Marin County were arrested this morning after PG&E ordered Sheriffs deputies to clear the two out of the way as a group of concerned residents gathered on Sir Francis Drake Blvd. in Inverness Park to deny access to PG&E's 'smart' meter contractors Wellington Energy. According to Elizabeth Whitney, a local who was present at the scene, "there was a group of about two dozen residents blocking about ten Wellington Energy trucks on Sir Francis Drake Blvd this morning. After some indecision and confusion amid stopped traffic, sheriffs deputies arrived on the scene. Under the direction of the sheriffs, eight of the trucks cooperated in making U-turns and turning back while the group stepped aside. The remaining two trucks lingered at the location (in front of a local delicatessen) in conversation with the locals but then turned toward Inverness unexpectedly and caused the protest group to resume their blockade. Two local mothers were arrested and taken into custody for failure to disperse. Sir Francis Drake Blvd. is the only access to Inverness and the incident took place in Inverness Park, two miles south of the town." Residents are reacting in part to numerous reports of people getting sick from the high intensity microwave radiation pulses from the new meters. Wireless impulses from the new meters radiate 24 hours a day and are approximately 2-3 times the intensity of a cell phone according to independent experts. Cell phones are increasingly being linked to brain tumors, and other health problems. Despite widespread calls for a moratorium until assurances can be made about the meters' safety, PG&E- with the help of the industry backed CA Public Utilities Commission (CPUC)- continues to force the meters onto homes and businesses, even while a state-ordered investigation into 'smart' meter health impacts is under way. The utility has been refusing to remove meters that are making people sick, despite more than 2000 health complaints to the CPUC. In recent years, public concerns have been raised regarding the potential negative health impacts of radiofrequency electromagnetic radiation emitting devices, such as microwaves and wireless phones. On March 30, 2010, the House of Commons Standing Committee on Health (hereafter the Committee) agreed to conduct a study examining this issue. During the course of its study, the Committee held three hearings where it heard from a variety of witnesses, including: government officials, interested stakeholder groups and scientific experts. This report summarizes testimony from these hearings, as well as written submissions received by the Committee. Finally, it also identifies ways in which the federal government could take further action in this area. Electromagnetic radiation is defined as waves of electric and magnetic energy that are transmitted through space and travelling at the speed of light. The area where these waves are found is called an electromagnetic field (EMF), which is made up of both an electric and a magnetic fields. Electric fields are created from static electrically charged particles. If these electrically charged particles are put into motion through a conductor, magnetic fields are then also created from the resulting electric current. For example, plugging in an electric appliance will create an electric field; however, it is only when the appliance is turned on and electricity flows that a magnetic field is then also created. Electromagnetic radiation is measured in units of wavelength and frequency. The wavelength is the distance that a wave travels in one cycle and is measured in meters. The frequency is measured by the number of cycles per second and the unit of measurement is the Hertz (Hz). One cycle per second equals one hertz. The frequency of the wave is inversely related to its length: the higher the frequency, the shorter the wavelength. Electromagnetic fields are present everywhere in our environment and are produced by both man-made and natural sources. For example, the main source of electromagnetic radiation is the sun, while other man-made items—such as hairdryers, electrical ovens, fluorescent lights, microwave ovens, stereos, wireless phones and computers—all produce electromagnetic fields of varying intensities. The electromagnetic spectrum arranges electromagnetic radiation according to its frequencies and impact on the human body. The electromagnetic spectrum is divided into two main categories: ionizing and non-ionizing frequencies. Electromagnetic radiation with low frequencies ranging up to 300 gigahertz (GHz) are called non-ionizing, meaning they do not breakdown chemical bonds in biological tissue, including DNA, which is the building block of genetic material in the body. However, non-ionizing electromagnetic radiation with low frequencies do produce electrical currents within the human body that could result in increases in body temperature. Increases in body temperature resulting from electromagnetic radiation are referred to by scientists as "thermal effects". For example, radiofrequency (RF) electromagnetic radiation that usually ranges from 30 kilohertz (kHz) to 300 GHz are able to induce electrical currents within the human body, which can produce a range of effects such as heating and electrical shock, depending on their amplitude and frequency range. RF fields are mainly used in telecommunications, such as mobile phones and other home appliances, such as microwaves. Microwave electromagnetic radiation is considered by scientists to be a subset of radio frequency fields. It is important to note that some scientists have found that long-term exposure to low level RF electromagnetic radiation could potentially provoke biological and chemical changes within cells that could negatively influence people's well being. These biological responses occur at the cellular level and do not involve heating. Scientists refer to them as "non- thermal effects" of RF and microwave electromagnetic radiation. However, these biological and chemical changes may not necessarily translate into adverse health effects. Meanwhile, extremely low frequency (ELF) electromagnetic radiation, which has a frequency of less than 100 kHz, is also able to induce electric currents within the human body, but these induced currents are lower than the electric currents found to be naturally occurring in the human body and therefore do not result in thermal effects. However, strong ELF electromagnetic radiation can produce nerve and muscle stimulation. ELF electromagnetic radiation can originate from electrical wiring in buildings, electrical appliances and power lines. Finally, electromagnetic radiation with very high frequencies and short wavelengths is able to produce enough energy to cause ionization, that is, it is able to breakdown chemical bonds in biological tissue, including DNA. The boundary between ionizing and non-ionizing electromagnetic radiation is the frequency of visible light, which ranges between 430 and 750 terahertz (THz). Once electromagnetic radiation reaches a frequency higher than 750THz, it is then capable of breaking chemical bonds in biological tissue. Ionizing radiation can range in frequencies from 756 THz to 4.61 exahertz (EHz). Sources of ionizing electromagnetic radiation include ultraviolet light, X-rays, and gamma rays. Excessive exposure to these sources can cause serious adverse health effects in the human body, such as cancer. Consequently, exposures to these levels of electromagnetic radiation are restricted both in Canada and internationally. Guidelines determining acceptable amounts electromagnetic radiation for safe human exposure are designed to prevent negative health consequences due to thermal effects. The impact of electromagnetic radiation on the human body is measured by the Specific Absorption Rate (SAR), which measures the amount of heat produced in the human body as a result of exposure to radiofrequency fields. It is defined as the rate of energy absorption per unit mass and is expressed in units of watts per kilogram (W/kg). The internal SAR cannot be measured directly in the body, but is estimated by theoretical calculations. The Government of Canada is responsible for setting the limits for safe human exposure to electromagnetic radiation from radiofrequency emitting devices in order to protect the health and safety of Canadians. Under the Radiation Emitting Devices Act, Health Canada is responsible for regulating radiation emitting devices. The safety limits that Health Canada has set for safe human exposure to RF electromagnetic radiation is in the frequency range of 3 kHz to 300 GHz. This limit is referred to as Safety Code 6 and results in an average SAR of 0.08 W/kg, which is deemed safe for all members of the population including the elderly, individuals with health concerns, children and pregnant women. Industry Canada is responsible for regulating radio-communication in Canada, including authorizing the installation of radio-communication towers and sites and the approval of RF equipment such as cell phones and assessing their compliance with their standards. Industry Canada derives this authority from the Department of Industry Act, as well as the Radiocommunications Act, which specifically provides the authority to approve antenna supporting structures. Industry Canada has chosen the RF exposure standard developed by Health Canada in Safety Code 6 as its basis for the regulation of mobile phones, base stations, Wi-Fi technologies and other radio-communication transmitters. The Committee heard from Health Canada officials that Canadians are protected from harmful exposure to radiofrequency electromagnetic radiation through Safety Code 6, which establishes the safe limit for human exposure to electromagnetic radiation from various devices. The Committee heard that Safety Code 6 is developed through a thorough review process that includes an evaluation of scientific evidence and literature on the effects of radio frequency radiation on biological systems. According to officials, this review process is consistent with guidelines provided by the World Health Organization for the development of health-based electromagnetic frequency standards. During the course of its review, Health Canada examines scientific evidence from animal, cell culture and epidemiological studies carried out worldwide. Officials further clarified that it examines studies that focus on both the thermal effects of electromagnetic radiation, as well as those that examine non-thermal effects occurring at the cellular level. In addition, the Committee heard that Health Canada has conducted its own studies on this topic, which have been published in peer-reviewed journals. In its evaluation of the existing data, Health Canada considers the quality of the individual studies, as well as the consistency of observed effects across laboratories. The Committee heard that while this review process was last conducted in 2009, Health Canada continues to review the scientific literature on an ongoing basis. Based upon this scientific review process, Health Canada has determined that human exposure to RF electromagnetic radiation in the frequency range from 3 kHz to 300 GHz is safe. Officials articulated that this limit is well below the threshold for any potential harm and it was designed to provide protection to all age groups, including children, if exposed on a continual basis. They further noted that in the development of Safety Code 6, models of children's bodies and brains were used to examine the potential effects of radiation exposure on tissue similar to that of a child's, as studies cannot be directly conducted on children due to ethical reasons. Finally, officials articulated that these exposure limits are comparable to those in other jurisdictions, including the United States and the International Commission on Non-Ionizing Radiation Protection, a standard adopted by most European countries. While Health Canada is responsible for the development of Safety Code 6, the Committee heard that Industry Canada is responsible for its implementation with regards to the regulation of portable radio-communication equipment, such as cell phones, as well as antenna towers and their surroundings. In order to ensure that portable radio-communications are in compliance with the standards established through Safety Code 6, Industry Canada requires that they be certified by accredited bodies. Once the equipment is on the market, Industry Canada continues to test individual units of these models to ensure that they continue to meet Safety Code 6 standards. The Committee heard from Industry Canada officials that a licence is required for the establishment of all new antenna installations. Industry Canada will only issue a licence if emissions from an antenna in areas accessible to the public are within the limits of Safety Code 6. Furthermore, the measurement of emissions also takes into account the cumulative effects of other antennas in the vicinity. Once a tower is operational, it remains a condition of its licence under the Radiocommunication Act to respect these limits at all times. The Committee also heard that Industry Canada continues to perform audits and tests on antenna installation sites after licensing to ensure that they remain compliant. Finally, the Committee heard that both Health Canada and Industry Canada work together to produce documents for Canadians concerned about RF exposure. They have produced a document entitled, "Frequently Asked Questions on RF Energy and Health" in order to address various questions related to RF exposure, as well as a handbook and numerous information sheets related to wireless communication and health. Some witnesses appearing before the Committee were of the view that limits established by Safety Code 6 were not stringent enough to protect Canadians from potential negative health impacts of long-term exposure to RF electromagnetic radiation. According to some scientists appearing before the Committee, the findings of their research indicated that there were non-thermal biological effects resulting from exposure to RF electromagnetic radiation that was below the frequency limit established by Safety Code 6. In their view, these biological effects could result in negative health outcomes for humans, and in particular children. For example, one scientist appearing before the Committee conducted a study which found that electromagnetic radiation produced from mobile phone handsets had resulted in a 60% reduction in insect reproductive capacity. The scientist further indicated that these findings were in line with other studies that had reported DNA damage in mammalian cells and subsequent links to human infertility. Other scientists outlined studies that had found other potential negative health outcomes as a result of exposure to electromagnetic radiation, such as links between cell phones and the development of brain tumours among children, and links between cordless DECT phones and affects on the heart such as arrhythmia and tachycardia. These scientists further articulated that many of the studies demonstrating that long-term exposure to low level radiofrequencies had not resulted in negative health outcomes had been funded by the wireless industry; and therefore, more publically funded studies examining the health impacts of electromagnetic radiation were necessary. Another witness appearing before the Committee articulated that in his view, the science behind the development Safety Code 6 did not take into account the interaction between electric currents naturally occurring in the human body and the RF electromagnetic radiation resulting from the environment. He articulated that he presented his findings to Health Canada and Industry Canada, but found that they were not taken seriously. The Committee also heard from community organizations representing parents who were concerned about their children's exposure to RF electromagnetic radiation in schools and the environment from Wi-Fi and wireless telephone base stations. These organizations articulated that both adults and children in their communities had experienced symptoms of headaches, sleep disturbances, problems with concentration, dizziness and heart irregularities. They further attributed these symptoms to exposure to Wi-Fi and wireless telephone base stations, a condition called "electromagnetic sensitivity". They articulated that governments and industry should recognize "electromagnetic sensitivity" as an illness. In addition, the Committee received numerous letters from interested individuals describing similar symptoms which they attributed to their exposure to cell phones, Wi-fi and wireless telephone base stations. These individuals also requested that "electromagnetic sensitivity" be recognized as an illness. Based upon these concerns, these scientists and community organizations argued that Health Canada should take a precautionary approach to human exposure to RF electromagnetic radiation. In their view, a precautionary approach is a public policy approach for risk management of possible but unproven adverse health effects. The precautionary principle is applied when there is only some evidence and that evidence remains inconclusive. According to these witnesses, in practice the application of the precautionary principle in relation to human exposure to electromagnetic radiation means that there should be a reduction of the exposure limits set out in Safety Code 6. Witnesses recommended that exposure limits in Canada be reduced to levels outlined in the Bioinitiative Report of one tenth of a microwatt per centimetre squared or 0.614 volts per meter. However, the Committee also heard from other scientists who were of the view that there was significant evidence to support the current guidelines for exposure to electromagnetic radiation under Safety Code 6, therefore lower levels were unnecessary. They pointed out that since World War II, thousands of studies had been undertaken on the bioeffects and potential health risks related to electromagnetic radiation, which includes over 1,200 studies examining electromagnetic radiation from mobile phones. According to these witnesses, this literature had been authoritatively reviewed in the last two years by: the World Health Organization, the Ireland Expert Group on Health Effects of Electromagnetic Fields, the European Commission, the United States National Research Council Expert Panel, the Royal Society of Canada and the Committee on Man and Radiation. In their view, these authoritative reviews have concluded that there is no compelling body of evidence of adverse health effects associated with electromagnetic radiation at levels below internationally accepted limits. However, these scientists also pointed out that there were certain gaps in the existing literature related to long-term low-level exposure and brain functions and reproductive outcomes, as well as the effects of long-term exposure among children using mobile phones. They consequently recommended that more long-term studies were necessary, as well as continuous review of the scientific literature. Furthermore, they suggested that while they supported the existing guidelines, individuals who did have concerns could take individual measures to limit their exposure, such as limiting their use of mobile phones. Wireless industry stakeholders appearing before the Committee also supported the need for long-term studies in order to ensure the long-term safety of their products. However, they also noted that a restrictive precautionary approach to electromagnetic radiation could have potential negative impacts as well. For example, they suggested that if Canada's safety guidelines were stricter than international guidelines, manufacturers would have to produce special phones for Canada, which in turn would drive up costs. Furthermore, they articulated that restrictive approaches to electromagnetic radiation emitting devices failed to take into account the benefits that they provided to society: over half of 911 calls are made through cell phones. In responding to concerns raised by witnesses, Health Canada officials indicated that they agreed that long term studies on the effects of low level electromagnetic radiation, as well as ongoing review of the scientific literature were necessary. However, they articulated that from their point of view a precautionary approach towards exposure to low levels of electromagnetic radiation was unnecessary as there was a significant body of scientific evidence available supporting Safety Code 6. They further emphasized that a precautionary approach was only undertaken by the department when limited scientific evidence was available. In addition, they pointed out that the studies that Health Canada had reviewed regarding electromagnetic sensitivity had failed to establish a causal relationship between the symptoms experienced by study participants and electromagnetic radiation, but further research was necessary in this area. Finally, officials from Health Canada expressed their willingness to work with individuals, communities and school boards to address their concerns regarding exposure to electromagnetic radiation. 2. Health Canada request that the Council of Canadian Academies or another appropriate independent institution conduct an assessment of the Canadian and international scientific literature regarding the potential health impacts of short and long-term exposure to radiofrequency electromagnetic radiation, which would include an examination of electromagnetic sensitivity and a comparison of public policies in other countries governing exposure to radiofrequency electromagnetic radiation; and report on its findings. 4. Health Canada and Industry Canada offer to provide information, including awareness sessions on exposure to radiofrequency electromagnetic radiation. World Health Organization, WHO Backgrounder: Electromagnetic fields and Public Health Cautionary Policies, March 2000, http://www.who.int/docstore/peh-emf/publications/facts_press/EMF-Precaution.htm. Unless otherwise noted, this section is drawn from: University of Ottawa/RFcom.ca, Frequently Asked Questions, http://www.rfcom.ca/faq/ answers.shtml#q8. Unless otherwise noted, this section is drawn from: WHO, What are electromagnetic fields, http://www.who.int/peh-emf/about/WhatisEMF/en/print.html. University of Ottawa/RFcom.ca, Frequently Asked Questions, http://www.rfcom.ca/faq/ answers.shtml#q8. Government of Canada, Wireless Communication and Health: An Overview, http://www.ic.gc.ca/antenna. University of Ottawa/RFcom.ca, EMF Primer, http://www.rfcom.ca/primer/index.shtml. WHO, What are electromagnetic fields?, http://www.who.int/peh-emf/about/WhatisEMF/en/print.html. Government of Canada, "Wireless Communication and Health: An Overview," http://www.ic.gc.ca/antenna. This table is based upon information provided in the following document: University of Ottawa/RFcom.ca,"Frequently Asked Questions," http://www.rfcom.ca/faq/ answers.shtml#q8 and University of Ottawa/RFcom.ca, "EMF Primer," http://www.rfcom.ca/primer/index.shtml. One cycle per second equals one hertz; one kilohertz (kHz) equals 1,000 Hz; one megahertz (MHz) equals one million Hz; one gigahertz equals one billion Hz; one terahertz equals 1012; Hz; and one EHz equals 1018 Hz . Radiation Emitting Devices Act, R.S., c.34 (1st Supp. ), s.1. Health Canada, Health Canada's Radiofrequency Exposure Guidelines, http://www.hc-sc.gc.ca/ewh-semt/pubs/radiation/radio_guide-lignes_direct-eng.php. University of Ottawa, Frequently Asked Questions, http://www.rfcom.ca/faq/answers.shtml#q8. Canadian Wireless Telecommunications Association, Connecting Canadians: Wireless Antenna Towers Siting in Canada, June 2008, http://www.cwta.ca/CWTASite/english/pdf/CWTA_Connecting09_08.pdf, p.14 and p. 20. House of Commons Standing Committee on Health, Evidence, April 27, 2010, No. 12, 3 rd Session of the 40th Parliament, http://www2.parl.gc.ca/content/hoc/Committee/403/HESA/Evidence/EV4467140/HESAEV12-E.PDF. House of Commons Standing Committee on Health, Evidence, October 28, 2010, No. 34, 3 rd Session of the 40th Parliament, http://www2.parl.gc.ca/content/hoc/Committee/403/HESA/Evidence/EV4738168/HESAEV34-E.PDF. House of Commons Standing Committee on Health, Evidence, April 29, 2010, No. 13, 3 rd Session of the 40th Parliament, http://www2.parl.gc.ca/content/hoc/Committee/403/HESA/Evidence/EV4478290/HESAEV13-E.PDF. It is important to note that Industry Canada officials did not specify which accredited bodies were providing certification of portable radio-communication equipment. Industry Canada and Health Canada, "Frequently Asked Questions on RF Energy and Health" http://www.ic.gc.ca/eic/site/smt-gst.nsf/vwapj/faq-energy-health.pdf/$FILE/faq-energy-health.pdf. House of Commons Standing Committee on Health, Evidence, April 27, 2010, No. 12, 3 rd Session of the 40th Parliament, http://www2.parl.gc.ca/content/hoc/Committee/403/HESA/Evidence/EV4467140/HESAEV12-E.PDF and House of Commons Standing Committee on Health, Evidence, October 28, 2010, No. 34, 3 rd Session of the 40th Parliament, http://www2.parl.gc.ca/content/hoc/Committee/403/HESA/Evidence/EV4738168/HESAEV34-E.PDF. Dr. Riadh Habash, "Potential Impact of Electromagnetic Radiation on Human Health," Brief submitted to the House of Commons Standing Committee on Health. House of Commons Standing Committee on Health, "Evidence," 29 April, 2010, No. 13, 3 rd Session of the 40th Parliament, http://www2.parl.gc.ca/content/hoc/Committee/403/HESA/Evidence/EV4478290/HESAEV13-E.PDF. Nintendo Releases Health-Safety Warnings for 3DS. But the church may step in to prevent the plans. Reverend Helen Freeston from St Peter's Methodist Church has moved to reassure people that she won't allow this to go ahead: "The church will not be having any antenna on its premises. The church is too concerned about its local community. That's the point of our existence." Technology conferences would seem to be a natural for great Wi-Fi access, but the technology was not intended for large rooms and crowds. "Dr. Pamela Jaffke and her cat Magic are likely victims of the Collusion and Conspiracy involving Utilities and PSC that were revealed and are contained in a letter to the Governor-Elect, Mr. Richard Snyder of Michigan, attached. This is a matter of public record, testimony was given in hearings at the Michigan Public Service Commission MPSC Case No. U-16129, Tensen Family Farm v Consumers Energy Company". Another excellent letter, (written by Angela Flynn) was used as testimony in a recent cell phone tower hearing. Thanks Angela. I am a health advocate and work on the issue of non ionizing radiation exposure in the radio frequency (RFR) band. I have a personal stake in this work, as I am one of the growing numbers of people who have become functionally impaired due to prolonged chronic exposure to RFR from a base station near to my home. I am aware that the Telecommunications Act of 1996 (TCA) prohibits the consideration of environmental concerns in the siting of base stations, if, the RFR emissions are under the FCC Safety Standard. However, the TCA does not prohibit the consideration of a loss of property value, and, as many people perceive that there is a loss of property value due to the negative health impact from the exposure to the RFR from cell towers it is incumbent upon the Commissioners to be informed of these impacts. Additionally, while there is cell phone coverage in this area, T-Mobile claims this tower is necessary to provide cell phone coverage along MD Route 26 and to the interior of people's homes. Neither of these is true. In Maryland, there is a handheld ban for all drivers; a ban on all cell phone use (handheld and hands-free) for novice drivers; and, a ban on texting for all drivers. No Telecom company should be promoting cell phone coverage for drivers as this encourages unsafe driving practices. Winfield has an estimated 348 residents. Of these, close to 250 have signed a petition against the cell tower. If the remainder of the people must have better coverage in their homes they can purchase their own femtocell. (http://en.wikipedia.org/wiki/Femtocell) This would be the far better option rather than unnecessarily exposing all Winfield residents to the RF radiation emitted by the transmitters on cell towers. The proposed 120 foot tower would be in close proximity to South Carroll High and Winfield Elementary schools. Children are more susceptible to environmental toxins, absorb more RFR into their bodies and face longer cumulative exposure than adults. This greater danger is being taken seriously by many scientific and governmental agencies. Jason Campbell, senior development manager for T-Mobile, USA, reports that the RF radiation levels from this cell tower will be 100 times lower than the FCC standards. This means the estimated RFR level will be 10 microwatts per centimeter squared (µW/cm2). This is the maximum allowable RFR exposure level in Russia, China, Switzerland, Italy and Monaco. The level claimed by Campbell may not take into account additional transmitters, which will further increase the RFR levels. In addition the reflective and amplifying nature of RFR in the environment may lead to localized RFR hot spots that exceed the estimated levels. The wide variance in RFR exposure limits around the world is due to the fact that some countries, such as the United States, dismiss non-thermal biological effects from RFR exposure. The limits only protect against thermal heating. Many countries have lower limits that factor in the non-thermal cumulative effects, which have been shown to occur at levels thousands of times lower than the thermal effects. Cell towers should not be placed near our homes and schools. As public officials you have a legal and moral duty to educate yourselves on this matter and to base your decisions on all of the information regarding negative health impacts from exposure to the radio frequency radiation from wireless communication transmitters and their subsequent negative impact on property values. And, in fact, if you go to this web site – No Cell Tower in Our Neighborhood http://sites.google.com/site/nocelltowerinourneighborhood/home/other-communities-saying-no - you will see some of the hundreds of communities, organizations, municipalities, school parents, individuals and residents who are opposing cell towers and are fighting off wireless facilities in their neighborhoods, including my local high school, Walt Whitman in Bethesda, Md.